Post #2 from Kate, “The Five Corners of the Text: Personal Experience and Text-Based Close Reading,” is on the essential–even unavoidable–“fifth corner” of a page: you. Kevin Hodgson does a beautiful job of synthesizing and responding to many Contributor posts from this week as he shares his challenges with bringing close reading to his practice, both as a classroom teacher and NWP consultant. Fran McVeigh wonders if close reading can happen in Kindergarten and if it’s appropriate. Kristi Mraz describes her view of “emergent close reading” in primary grades as being teaching stances. Gwen Flaskamp cautions that we are teachers “of literacy, not just with literacy” and need to be sure we teach close reading skills explicitly and not simply assign students to complete graphic organizers. Vicki Vinton shares a cautionary tale, suggesting we must always look at transference of our teaching to students’ own independent work, not simply kids “doing” close reading in a wrote way that they cannot apply. Anita Ferreri has powerful ways of describing reasons for reading. Rhonda Sutton shares this new post and a link to a previous where she thinks through a definition of close reading. Kim Corbidge thinks about using picture books to support students in reading between the lines. Post #3 from Chris, “Close Reading is a Habit, And Habits Stink,” is on some of the “how-tos” of close reading instruction. Post #4 from Kate, “What My Mother Taught Me About Close Reading,” looks at the balance of direct instruction and freedom, how crucial both are to lead to independence. Sarah Picard Taylor shares smart ideas about ways to rethink book shopping, organization and read aloud in primary classrooms to support emergent close reading habits. Dea Conrad-Curry uses the example of teaching her students the importance of looking for motifs as an example of the power of explicit teaching of skills. Colette Bennett offers another glimpse into her classroom and one approach to supporting students in carefully reading a text. Tara Smith writes brilliantly about stumbling upon close reading her first day of school letter with her sixth graders and her hopes for building habits that last. Through twitter, Angela Schroden directed our attention to this white paper released from IRA this week, by Catherine Snow and Catherine O’Conner: “Close Reading and Far-Reaching Classroom Discussion: Fostering a Vital Connection.” A brilliant and carefully researched response to the Close Reading conversation, we think it’s an important read for all of us. Fran McVeigh beautifully points out that the habits of close reading are also ways we as teachers should read our students closely and carefully. Deb writes about being careful to not get distracted when paying attention to the “wrong” details in her fun post about watching a Red Sox game. Post #5 from Chris, “Close Reading Nonfiction (Why? and Oh! )” describes many educators aversion to nonfiction reading instruction and a way to release yourself from that feeling (ha! ), even with close reading methods. Post #6 from Kate, “So Much Depends on the Bean Salad: Writing About the Details of a Text,” is a deeply personal look at how small details are worth examining, reflecting on, and often hold much larger meaning then we first realize. Brenda Krupp (of Richard, Judy, and Brenda) highlights the essential practice of reflecting after reading closely. Fran McVeigh makes an argument for the use of nonfiction texts in close reading and offers some beginning thinking about just when that might happen and what sorts of texts could be involved. Jerry Blumengarten (the ever popular @Cybraryman) shares his internet-librarian page on Close Reading. (This resource is amaz-o!) . Kathy Perret (a co-founder of #educoach chats) shares with us her obsession with understanding close reading (you’re among family, Kathy!) and slides of instruction tools she has been developing for educators she works alongside. Kevin Hodgson shares a nonsense-word story that he has used to support educators in looking more closely at reading comprehension, in this post he begins to consider ways of bring this to close reading. Post #7 from Chris, “Most Fun Close Reading Post Ever Because Students Are Hilarious And Filled With Rage” shared some hilarious-awful tweets from students and their uncensored views of close reading instruction, he also argued for conversation as an essential element in our more engaging instruction. 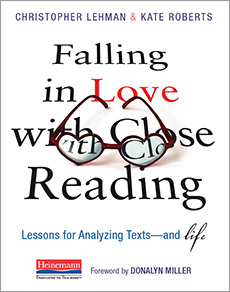 Post #8 from Kate, “Take a Peek at ‘Falling in Love with Close Reading!’,” Kate shares sample chapters from our new book as well as several contributor posts from this page. Clare and Tammy think about formative assessment throughout teaching, as opposed to simply “prepping” for “the test,” as an important engine for making our teaching responsive and important to students. Dave Stuart referenced a book he had been reading and quoted, “If you treat a strategy as a list of steps to follow, then the learning you get back will be similarly prosaic,” reminding us to keep our teaching full of life. Amy reflects on the many purposes for reading (from broadly to closely) she has in her own life and suggests we help students make decisions based on purpose as well. Fran McVeigh brings us a slice of life: attending an EdCamp and seeing “close reading” as a skill for living throughout the day. Love it! Post #10 from Kate, “Losing Facebook Friends and Other Tragedies: Close Reading Nonfiction for Point of View,” looks at point of view not just in texts, but in media and our lives, and offers sentence frames to support students. Anna Gratz Cockerille thinks about close reading in the workforce, interviewing people in different careers to consider what these practices may look like beyond schooling. Deb considers the differences between students who are creating a full, elaborate movie in their minds versus those that have one simplified cartoon strip panel and how close reading could move those thinkers along. Patrick Klocek (“one of the most gifted administrators I know,” says Chris), launches his blog this week, where he will share his journey as a school leader in studying close reading practices with his staff. Susan Scripsema argues that “’close reading’ must be purposeful, part of a coherent experience, rich with [students’] own observations and interpretation” in her post about a student versus grade level benchmarks. Colette Bennett takes us into a lesson with High School students, where they close read paintings before turning to reading (including the awesome suggestion to digitally crop the image at first!). Kathy Perret links to some “answer frames” and asks for your thoughts on their use for close reading. Kevin Hodgson shares a Prezi overview of close reading he has used, and welcomes you to “steal it, adapt it, remix it and re-use it” (thanks Kevin!). Nearing the end of our blog-a-thon, Tammy and Clare remind us of Kate’s post #2, and reflect on the “fifth corner” not just being for children, but for educators while we “closely read” information on close reading. Vicki Vinton takes the image of those student tweets from Chris’ post #7 and makes the inspired distinction between teachers and packaged programs (this is truly a post to forward to the decision makers in your district). Fran McVeigh continues from Vicki’s post, asking how carefully schools select programs (if/when they do) and she offers extremely helpful questions for that process. Fran McVeigh commented on the reasons educators sometimes choose texts, offering us a way to think about our approaches. Dave Stuart wonders if a text’s worth comes from the reader or the text itself and invites readers of his blog to debate. Stephanie Hardinger tweeted about using Kate’s post #10 sentence frames to analyze history texts. JoEllen McCarthy brings us back to the essential need for love: love for texts, our teaching, our mentors (and she shares some of her favorite nonfiction authors). Post #11 from Chris, “#CloseReading Structure OR When You Stop Making Sense,” is on being okay with lessons not going well (as they often don’t) and some thinking about analyzing structure. Post #12 from Kate, “A Day in the Life of a Close Reader,” explores close reading as a skill for living a more engaged life (and guest starring Hutch). Judy Jester shares some work using transmediation (capturing meaning from one medium in another), including some practical–and inspiring–examples. Fran McVeigh reflected on her own learning and highlights the role of conversation, both with oneself, with others through writing, and in speaking as a key ingredient in close reading. Tara Smith takes us across the school day, sharing ways close reading is popping up in different subject areas (as well as raising more important questions about this practice along the way), also including a shout out to Notice and Note. The final post from Kate is “Thank You” thanking everyone involved in the blog-a-thon and the release of our book, and Chris posts “#HappyBookday Falling In Love With #CloseReading!” about the book and other ways of staying connected. Anna Gratz Cockerille uses Jerry Spinelli’s Stargirl to reflect on learning from the blog-a-thon. Melanie Holtsman BRAVELY (go you!) shares a video of herself as a coach teaching a Close Reading lesson in Kindergarten (for the first time ever!). A few people tweeted this link, but we first caught Angie Spann‘s tweet about a NYT Learning Network post from Jonathan Olsen on using storyboards to inspire close reading. Gwen Flaskamp suggests that we stay mindful of teaching students the how as well as then why of reading skills and strategies we teach. Thanks for all of the great thinking! We’ve learned so much with all of you! Melanie I really enjoyed watching your great lesson on close reading and visual text lesson for those kinders. We enjoyed watching it today during our Kindergarten team meeting and had a meaningful conversation on what it should look like in our classrooms. Thank you! Wow! Thanks so much for letting me know. We are learning and trying what we learn here, but like to share and hear from others. Thanks! I share out an activity that I am revamping with Close Reading skills in mind. It’s a bit of ridiculous text that engages students as thoughtful readers because of the confusion it sows in their heads. I am enjoying the series and blog post so far. And I added some of my own thinking, too. Would it be right to think that as a reader, close reading, to be most authentic has a personal satisfaction involved- That there is a part of me that stops to mull around the text because there is some intrinsic force at work that wants to understand the author or topic or event in a new way? My husband is always poking fun at my desire to know and understand things deeply. I think there is a part of me that is in a constant state of curious. Why? What caused? What’s behind this idea or that? Is it developing this deeper sense of wonder that can help kids develop more natural bend toward close reading in an authentic way? Becky, I agree. Close reading is one way of acting on our intrinsic desire to know more.